The institute is affiliated with Board of Technical Education, U.P., Lucknow. All running courses are approved by All India Council for Technical Education (AICTE). The Students are given admission in the institute after qualifying Joint Entrance Examination in order of merit. Students are admitted in diploma courses through State level Joint entrance examination. Admission forms are available in the month of December/January every year at all recognized polytechnics in Uttar Pradesh. Entry qualification for diploma Courses is High School Exam Pass with Science and Mathematics(10+). Minimum required age is 14 years on 30th June but there is no upper limit for all regular diploma courses. More than 60% course is hand on experience. 40% course is concerned with theoretical and analytical methods. Transparencies, video films, slides, models are used by teachers to make clear conception of complicated engineering process and theories. 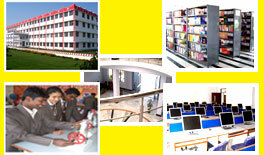 The Institute has a rich library and well equipped learning resource center. Scholarship is admissible to the scheduled cast/tribes, OBC candidates and General Candidate as per Government rules.